Glacial Snow Lotus is a polycarpic, shortly stemmed, perennial herb 2-6 cm tall. Caudex is slender, branched, with several leaf rosettes and flowering stems, covered with remains of leaf-stalks. Stem is solitary, 1-3 mm in diameter, erect, simple. Rosette and stem leaves are shortly stalked. Leaf blade is narrowly elliptic to obovate, 1.5-4 x 0.4-1 cm, below white woolly, above yellowish or white woolly, base wedge-shaped-narrowed, margin rounded toothed or entire, tip blunt. Flower-heads are 3-15, in a hemispheric synflorescence 1.5-4 cm in diameter, stalkless. Involucre cylindric to narrowly bell-shaped, 7-10 mm in diam. 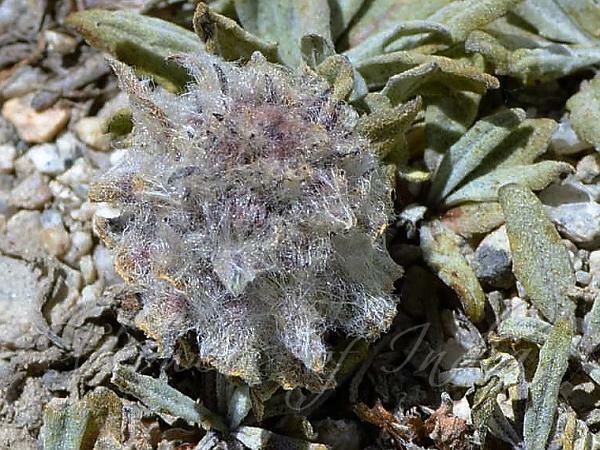 Phyllaries are in 3-4 rows, scarious, purple or blackish towards tip, tip pointed to tapering; outer phyllaries narrowly ovate-elliptic, 9-13 × 2.5-3 mm, apically woolly; middle phyllaries narrowly oblong, 8-13 × 1.5-2.5 mm; inner phyllaries narrowly elliptic to linear, 9-13 × 1-1.5 mm, hairless. Flowers are purple, 9-10 mm, tube 3-4 mm, limb 6-6.5 mm, petals 2-2.5 mm. Achene cylindric to obconic, 3-4 mm, hairless. Pappus in 2 rows; outer bristles dirty white, 2-5 mm, rough to plumose, sometimes lacking; inner bristles basally brown, apically dirty white, 8-11 mm. Glacial Snow Lotus is found on alpine scree slopes, at altitudes of 3800-5200 m, in E Afghanistan, NW India, Ladakh, E Kazakhstan, Kyrgyzstan, Mongolia, N Pakistan, Siberia, Tajikistan. Flowering: July-August. Identification credit: Miroslav Dvorský Photographed enroute to Khardung La, Ladakh.